The view looking west across Upper Saranac Lake from Canaras Conference Center, the St. Lawrence University retreat. To the left, in the distance, is Whiteface Mountain. To the right is Green Island. The second weekend of June just passed and Mrs. F. and I made our annual journey to Canaras, the great camp St. Lawrence University operates as a conference center. The camp, which I wrote about in detail last year, is a treasure whose worth I wouldn’t dare to quantify. Made up of three camps: Canaras, Ne-Pah-Win and Cadeceus, the place has been a part of my life for 10 summers. Though the hilarious Bob Sheldon, who graduated from St. Lawrence in 1977 and has served as director of the camp since 1990, insists that I spent more time drinking Scotch than scrubbing toilets, I worked on the 2000 staff. That magical summer cemented my affection for the Adirondacks. During the course of our alumni association meeting there (I was just elected secretary of the association’s governing board), we met with the University’s president, Bill Fox ‘75. With a partly cloudy fiscal forecast for the next two years, there was a lot of worry that the University might consider selling the place. Not so, Fox said. Sighs of relief echoed across the lake and the Laurentian diaspora. Thursday afternoon’s Adirondack Daily Enterprise, the only daily newspaper published in the Adirondack Park. I think a lot about the Adirondack Daily Enterprise and the Lake Placid News, those journalistic jewels of the Adirondacks where I began my career. During these Olympics, I’ve been thinking of my old papers almost every hour. Two colleagues and friends, senior sports writer Lou Reuter and managing editor Peter Crowley are on the ground in British Columbia, covering the competition and the events surrounding it. I’m very tardy in making mention of their efforts during this XXI Winter Olympiad and, for that, I am sorry. Hardly any newspapers in this country, save for the largest titles, were able to send correspondents to Vancouver. It’s the newswires’ show. It’s simply remarkable, therefore, that a company whose papers’ combined circulation is flirts with 8,000 in the best weeks and months, believes enough in the Olypmics to send two journalists to cover them. 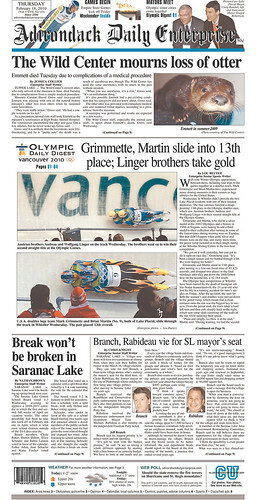 As John Warren, editor of the Adirondack Almanack, a site that complements the Enterprise’s hyperlocal coverage of the Tri-Lakes, correctly pointed out Wednesday, the Adirondacks are deeply focused on the Olympics. 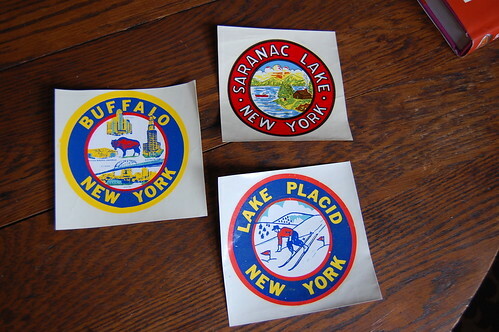 More than a dozen American athletes have connections to Lake Placid, which, of course, played host to the games in both 1932 and 1980. The place lives and breathes for the games. I’ve envied Peter and Lou as they’ve stalked the venues at Whistler and in Vancouver and Richmond. They’re doing their publications a terrific service. Lou, of course, is a sports whiz. He’s covered World Cup competitions for better than 15 years. 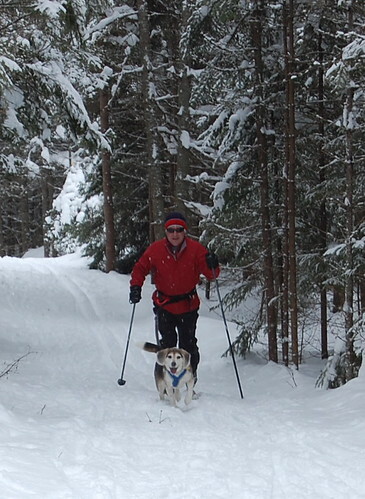 Peter, whose roots are on the news side of the shop, has worked to shape his coverage on how the Adirondacks as a region and a tourist destination are being represented in Vancouver. In addition to their updates several times a day, the Enterprise has linked to several local athletes’ blogs and Twitter feeds. Let’s hope it’s not the last winter games for Peter, Lou or their paper. You can be sure they’d jump at the chance to cover the next round in Sochi. To follow their coverage, visit the Enterprise’s Web site here. 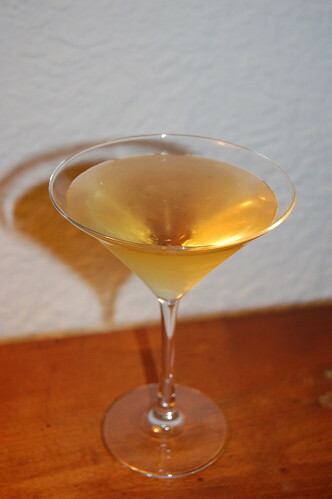 The Knickerbocker, a variant of the classic gin Martini. After a long haul at the paper, there’s nothing better to forgive the day’s various petty injustices like a dry Martini. That first cool whisper of gin sets aside all the aggravation and begins a cycle of well-deserved relaxation. It is a ritual I cherish. It’s also a ritual that can use a little change from time to time. And so, last night, after slogging through a day on our business and sports desks, I turned to the Knickerbocker. Essentially a dry martini with a splash of red vermouth, the Knickerbocker’s origins are mysterious. It seems like the kind of concoction that would have been enjoyed my journalistic forebears during Prohibition. I suspect it might be named for the Hotel Knickerbocker where an Italian bartender named Martini di Arma di Taggia allegedly gave birth to the holiest of mixed drinks. There’s also another, older Knickerbocker recipe that calls for rum, curacao and raspberry syrup, but it seems a bit summery and will have to wait until 2010. This Knickerbocker has its charms, especially for vermouth lovers. I prefer my martinis dry as a bone — I use atomizers to dust my glass with vermouth, if I use any at all. This may be my St. Lawrence roots speaking. 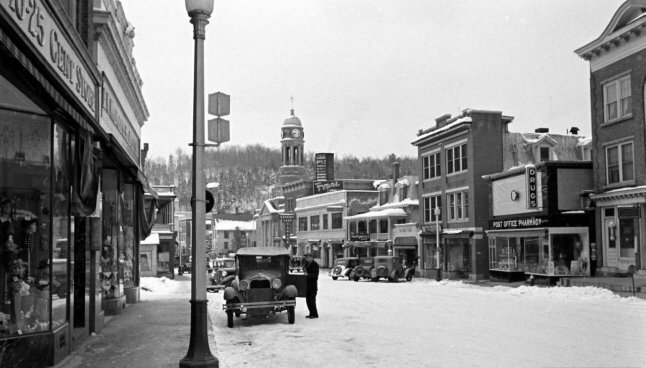 There’s an old anecdote about some ancient alumni at Canaras, our Upper Saranac Lake retreat, who, at cocktail hour each summer night, are alleged to have waved their glasses east toward France and Italy to acknowledge the vermouth before diving straight in with beautiful, ice cold gin. Still, the Knickerbocker is worth a try to vary your routine. Add all ingredients to ice in a shaker. Shake, serve and enjoy. • Garry Trudeau, native of Saranac Lake, contemporary of presidential candidates and presidents alike at Yale and creator of “Doonesbury,” recently gave a long Q-and-A interview with Tim Rickard of the Greensboro, N.C. News & Record. Trudeau said he believes most newspapers, while not suffering as badly as major metros, need to focus on creating a reliable, pay-to-read Web utility. He also talks about his work and his politics. Read it here. • Gawker reports this morning that Condé Nast has decided to fold the venerable Gourmet, its parenting title, Cookie, and a pair of bridal books. The plan, apparently, is to keep the 70-year-old cooking journal alive on the Web through Epicurious.com and other ventures. What a shame. • Here’s a nice, if critical, wrap-up on last night’s episode of “Mad Men,” “Souvenir,” from New York. • The Atlantic has sewn together a group of perspectives on how Associate Justice Sotomayor, who joined the Supreme Court today, will change that institution, if at all. • And, surprise, Blake Lively doesn’t know who Jimmy Buffett is. From Esquire. 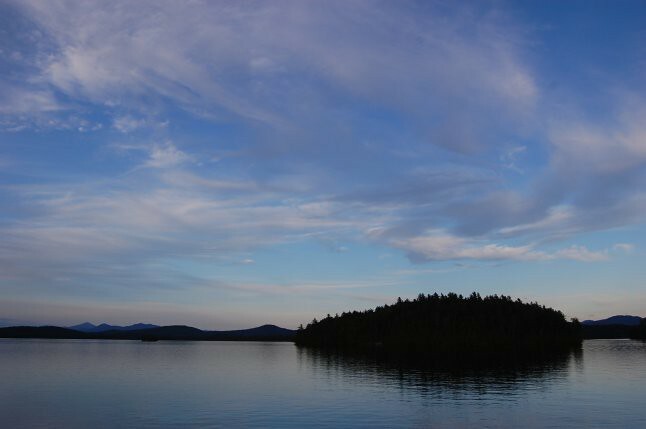 Land’s End, a magnificent Upper Saranac Lake great camp built in 1931, is currently on offer from Merrill L. Thomas, the leading broker in the Adirondack Park. Land’s End, which could lay a claim as the grandest camp property on Upper Saranac Lake, is for sale. The property, which includes a main lodge, a boathouse and other outbuildings on a 16-acre lakefront parcel, is basically turn-key and, compared with less properties in allegedly more-popular markets, is a very good bargain. This historic waterfront estate was originally constructed in 1931 for the duPont family. A restoration in 1993 brought Land’s End back to its original form. 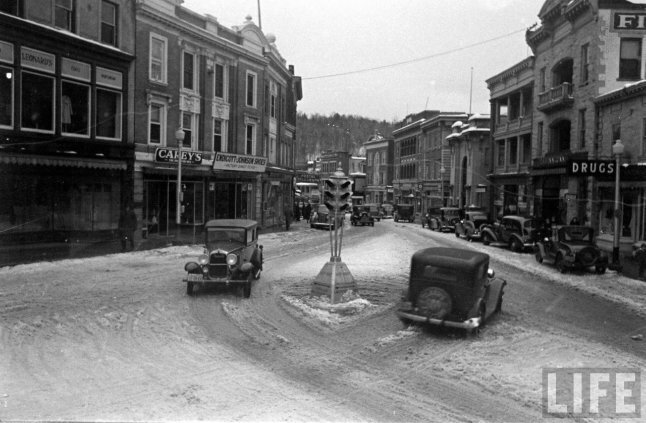 It is a symbol of 1930s architecture in the Adirondacks. 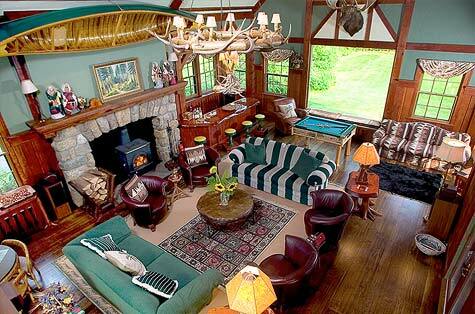 The 12,000 square-foot main lodge offers 8 bedrooms, 8 full baths and 2 half-baths. Dramatic great room accented by post and beam trusses, fieldstone fireplace and custom bar with views of the lake. 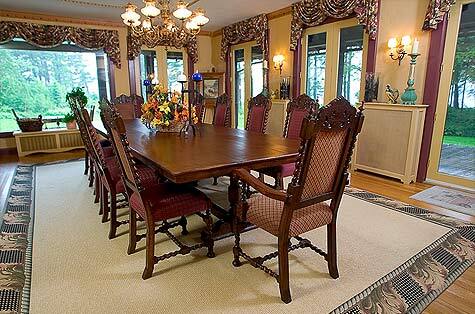 Stately dining room that will provide endless entertainment for you and your guests. Professional kitchen detailed with butler’s pantry, butcher block island, original cabinets, commercial appliances and walk-in cooler. Other distinctive highlights include 5 additional fireplaces, gameroom, separate structure with full workout facility. Two stall garage with caretaker’s quarters and a gardening shed for all your tools. Two story boathouse with one bedroom, two full baths and kitchen. A lean-to and fire pit are conveniently positioned on the water’s edge. Land’s End is located on the northern shore of Upper Saranac lake. Access is year round. Minutes from Adirondack regional airport (4,400 square-foot airplane hangar available) and renowned Saranac Inn 18-hole golf course. A level 16.6 acres with giant white pines growing throughout the property. 843 feet of sandy shoreline ensures easy access to the water. Wooden walkways sprawl the compound. 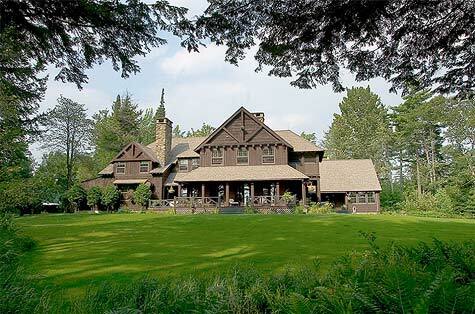 The property is on offer from Merrill L. Thomas, the Lake Placid-based brokerage. Steven L. Reynolds is the property’s broker. Steve can be reached at Steve@adirondackestates.com. To see a detailed listing, including more photos, click here. 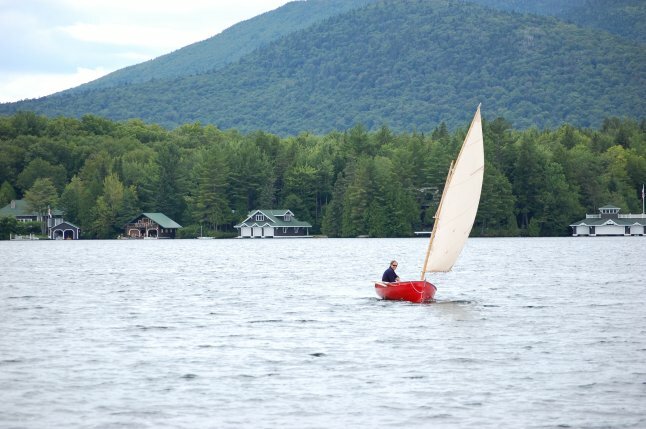 Steve Hann, an Adirondack renaissance man, sails his “Sadie” across Placid Lake’s harbor. Beekeeping. Snowmaking. Boat building. These are just a few of Steve Hann’s diverse hobbies and interests. He and his wife, Molly, are fellow Laurentians (He’s in the class of 1997, she’s a 2003 graduate) and very dear friends of ours. A visit to their Saranac Lake home is a treat in any season as there’s always something a bit unusual going on. Stopping by in June, for example, you might find the Hanns tending to their Lost Apiary or harvesting wild leeks. In the winter, there’s skiing and, more recently, ski-making. In the shoulder seasons and just about every night of the year, in their basement workshop, there’s wooden boat building and repair. Sadie is a 12-foot dinghy built on plans published by Frederick Goeller in the 1948 volume “Rudder Sail Boat Plans.” She’s planked with white cedar on steam-bent white oak frames. She has white pine seats and carries oars Hann made from ash. She carries a Gunter sail rig and has no motor. Hann estimates her weight at between 175 and 225 pounds with a four-foot, three-inch beam, a two-foot, eight-inch draft (with dagger board down; she carries a nine-inch draft with the dagger board up) and a sail area of 83 square feet. Hann launched her on Aug. 24, 2006 in Upper Saranac Lake and, during that maiden voyage, he asked Molly to marry him. She said yes. 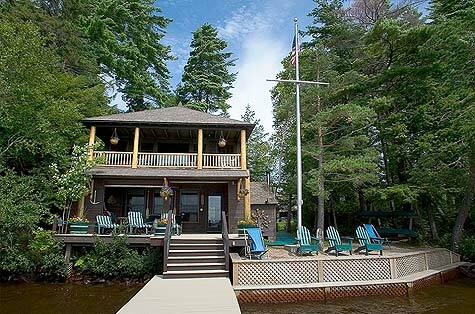 On Sept. 8, 2007, the newlyweds arrived at their wedding reception on Lower Saranac Lake aboard Sadie. We spent a recent afternoon on Placid Lake’s East Lake with Hann and Sadie is a terrific recreational day sailer (though Hann and Molly do use her for overnight camping trips). She’s easy to handle, responsive and a boat that’s sure to become a wonderful heirloom for generations of Hanns. A large porch, replete with an outdoor fireplace and rocking chairs, connects the Main Lodge with Spruce Cottage at Camp Canaras. We traveled north last week for annual sojourn at Canaras (Saranac spelled backwards), the Upper Saranac Lake great camp St. Lawrence operates as a conference center and informal resort. As your writer is a member of the alumni association’s governing board, he enjoys the privilege of visiting the lakeside retreat every year for the group’s annual planning meeting. Canaras, simply put, is the Laurentian response to Deer Island. (Although, from one report and a look at Deer on Google Earth, St. Lawrence is doing a considerably better job then the Bonesmen in keeping up their camp!) The camp opens in May and hosts various University retreats in conferences in June. In August and July, Canaras welcomes alumni for week-long stays. There are waiting lists several years long for each week. Not surprisingly, the place is rustic. It’s not winterized. The decor in most cabins, heavily accented by ancient bureaus and dusty taxidermy, hasn’t been updated since the Nixon administration. The meals are old-fashioned: Filet and Lobster, chicken a la king, very little pasta. For recreation, there’s sailing, waterskiing, kayaking, canoeing, tennis, hiking and, of course, drinking. 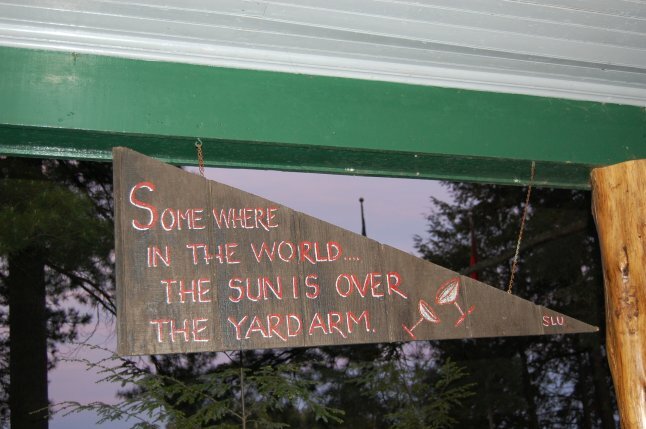 On the porch of the main lodge, an old sign painted by a Delta from the class of 1946 reads, “Somewhere in the world, the sun is over the yardarm.” Indeed. Every night at 5, all activity ceases for a solid hour-and-a-half cocktail hour that’s followed by dinner and vesper drinks before the fireplace on the main lodge porch. The property, which occupies a quarter-mile of lakefront property near Saranac Inn, is formed by three camps St. Lawrence stitched together: Camp Canaras, which includes the Main Lodge and its outbuildings (a lakeside tea house and dock, a pantry, an ice house, a linen barn, a staff cabin, a large garage and a woodshed), Spruce Cottage and Bentley Cottage; Camp Ne-Pah-Win, consisting of Harding Cottage (President Harding and his wife purportedly stayed there around 1915), Ne-Pah-Win Hall and Jackson Lodge; and Camp Caduceus, which includes five cottages, a library, another garage and a boathouse. The university bought Canaras and Ne-Pah-Win, both of which were largely designed by noted Adirondack architect William G. Distin between about 1913 and 1930, from Sloan-Kettering in 1965. Legend has it that Foster Sargent Brown ‘30, St. Lawrence’s 13th president, and his daughter were on their way home to Canton from a hike near Lake Placid when, driving along Route 30, they saw a for-sale sign. For a pittance, Brown engineered the purchase of the first two sections of the camp from Sloan, who’d received the place a few years before from Laurance Rockefeller, brother of the governor. 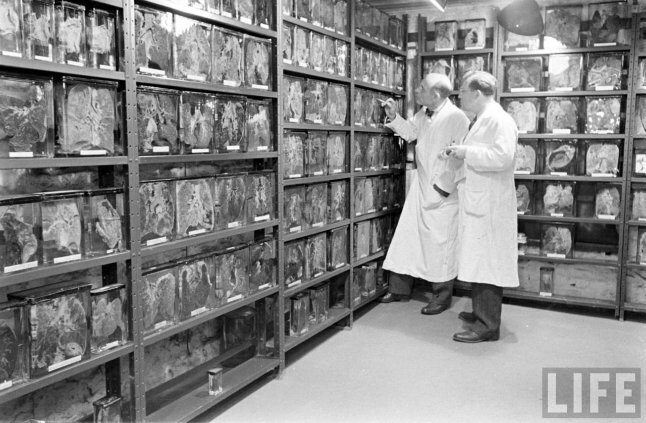 In 1968, the widow of prominent New York physician Harry C.W.S. deBrun donated her two camps, Caduceus and Sunrise to the University in her husband’s memory. The Sunrise property was later sold to a pair of St. Lawrence alums. I worked at Canaras during the 2000 season, or, as the joke at camp goes, I “lived” there, drank a lot of Scotch, waterskied and washed a few pots. It was a wonderful summer and my experience there kindled my love for the Adirondacks. You can see full-sized version on my Flickr Stream here. I picked up this trio of fabulous 1950s decals late last month in an eBay auction. They were meant to be applied to the wall of a suitcase or to a windshield. I think they’re gorgeous, but they’re hardly easy to apply. They have to be dipped in lukewarm water for 30 seconds or so, allowed two more minutes to dry and are then gently peeled from their paper backings onto whatever surface you’ve chosen. These will ultimately reside on an old steamer trunk in my parents’ attic that’s already speckled with old Cunard luggage labels. I’m planning to eventually use the trunk as a coffee table. Close-up views of each decal can be seen on the jump.